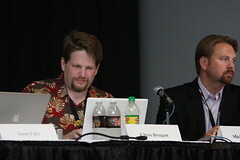 Chris Brogan & Lee Odden on a panel at BlogWorld - Photo credit: (CC) Brian Solis, www.briansolis.com and bub.blicio.us. Where do you go when you’re throwing around the idea of purchasing a new product for yourself or making a business investment in a solution? It’s safe to assume that the majority of people would say that is a no brainer. You go online! A recent study shows that over 44% of B2B marketers are utilizing blogs as a marketing channel. How can you make sure your blog stands out in a sea of content online? TopRank CEO Lee Odden will provide insight into using your blog as an engagement tool for your audience. Odden’s presentation “Optimize and Socialize You Way to Better Blogging” will emphasize the importance of combining both an optimized and a social element to boost your traffic and increase your reach while providing scalable and engaging information that audiences can apply to their own business.